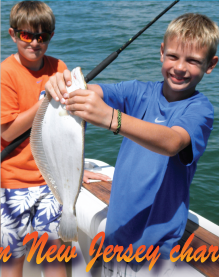 Tuna fishing in New Jersey is the ultimate challenge on rod and reel. New Jersey tuna are highly migratory and can be found all over the ocean. 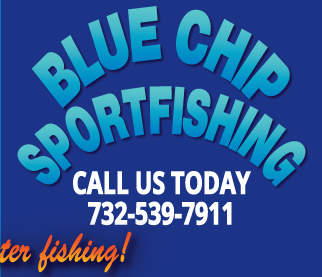 On the Blue Chip we catch tuna from June through Oct. The Mud Hole, the Fingers, the Glory Hole, and the Chicken canyon areas usually produce fish from 20 to 120 pounds. Also, the Mud Hole can see Bluefin Tuna over 300 pounds only twenty miles from shore. In addition to fishing the areas mentioned, tuna can be found in the open ocean, by finding whales,porpoises, and baitfish, which the tuna swim with and feed on. 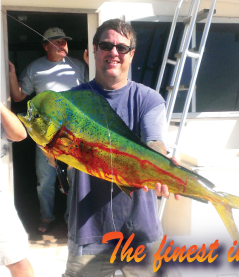 By-catch on a N.J. tuna charter in can be Dolphin,Mahi Mahi, Bluefish, Bonito, False Albacore, big Sharks, Marlin or Swordfish. Tuna are all muscle and hit with tackle smashing power. When hooked, tuna make a long powerful run that will really get your heart pumping. Then they dive deep which will get your right arm pumping. After a few more runs, going deep again,tuna start circling and you think the fight is over, but hang on… they dive again and the whole process starts over! 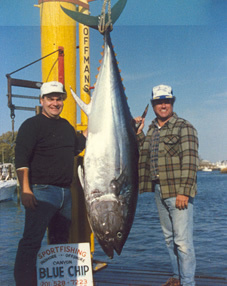 This is why tuna are highly prized by Big Game fishermen in New Jersey. Tuna are fast active feeders and it is ultra exciting to see the tuna swimming with whales, and feeding on the surface. 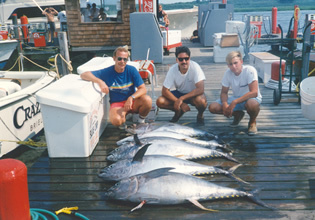 We catch Tuna fish in New Jersey by trolling or chunking cut bait, and jigging. As always, all the tuna you catch on the Blue Chip are yours to keep, after Wayne,The first mate cleans them and bags the steaks up for you. Exception: The proceeds from Giant tuna that are sold to the market, are split 50/50 between the charter and the crew. Giant tuna march to a different drummer and show up when and where they want to, so send us an e- mail & we will put you on a list, to call you when they deceide to pay us a visit !